I dabble in garment sewing. Admiring fashion for afar has been my life. I was never a girlie girl. My knowledge of make-up, fashion and hair have only been shared with me in the past few years from my dear friend Shari ( she is fabulous) and my teen aged daughter who has mastered the perfect cat eye eyeliner and what looks best with what. On Facebook, I stumbled across a dress and started the mad search to find out who made it. I am always on the lookout for well fitting garment patterns. I discovered it was the Wiggle Dress by Patterns for Pirates. I had to make one! 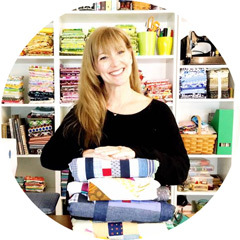 When it came time to stitch up my knit, I was torn between using my sewing machine and my serger. Twin needles were recommended. Twin needles have always been a mystery to me and I did not want to trust my beginner skills with them, so for this dress I used my Janome My Lock 644D. 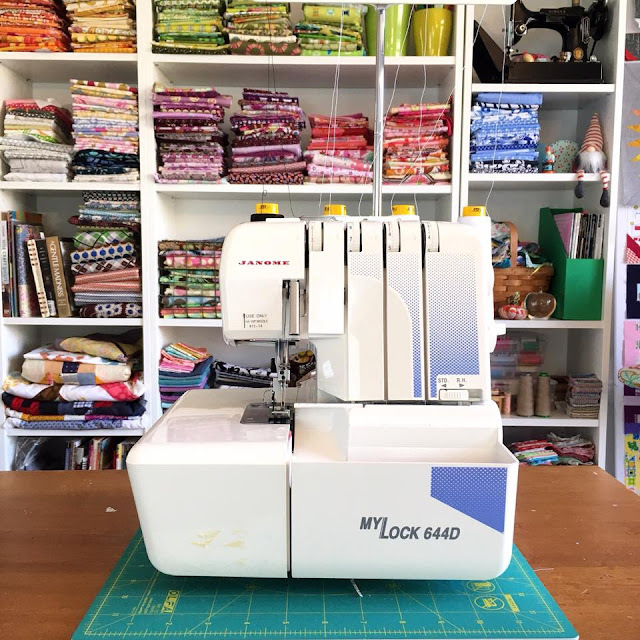 I could not find my model on their website ( it is pretty old) but you can see more of the Janome sergers here. Mine is a workhourse and puts up with me so I cannot complain! During the Christmas break, I recieved samples of the new Aurifil 40wt 3ply thread. It is a 100% cotton thread that is specifically designed for longarm quilting. When using the Aurifiil 50wt or 40wt 2 ply thread on my serger, it would have issues with breaking. The 40/2 works but it is not a perfect match for the higher speeds. The 40/3 is an absolute dream! It is absolutely smooth as silk and has no lint at all. I was a little surprised at how easy it was to tie off my other thread and have the new thread glide right though. That never happens! I also tried these cool Mini Clover Clips. I purchased them by mistake but they are by far my most favorite find of 2017! It makes securing the knit in place so simple and without stretching the fabric. The fun colors and size also help me to keep track of them and not drop them in the carpet for my kids to find later. You can see the difference in size. 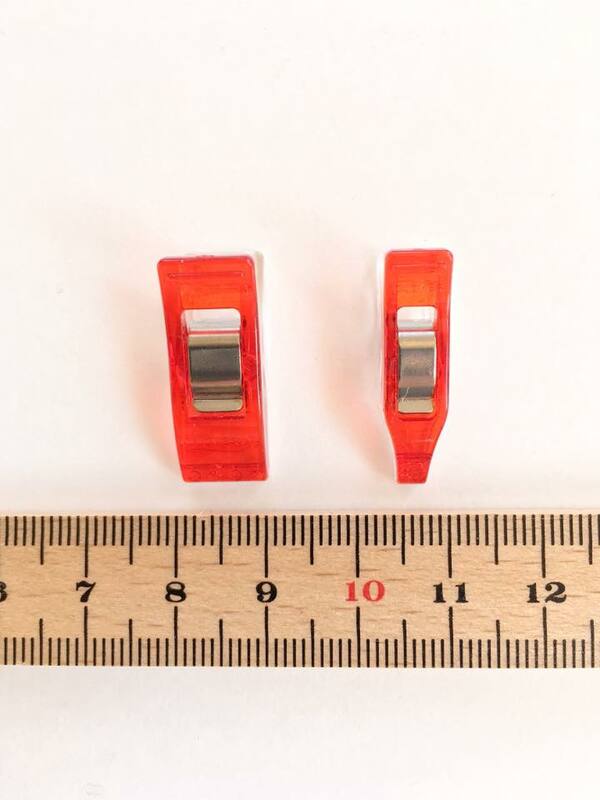 These are also great for curved piecing! And speaking of curved piecing, I discovered a fabulous thing! If you are a quilter and have been spooked by garment sewing because of setting sleeves...guess what...it is the exact same as curved piecing! Have the right tools on on hand. 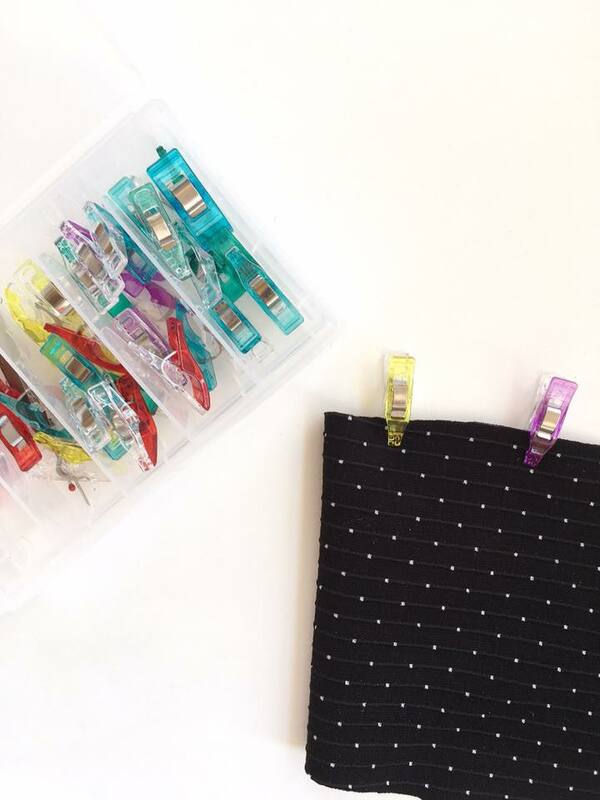 Marking tools, scissors, the correct needles for fabric and good sharp pins will help you be much more successful and much less frustrated. Make sure to read not only the fabric requirements but the notions you will need to complete the garment. 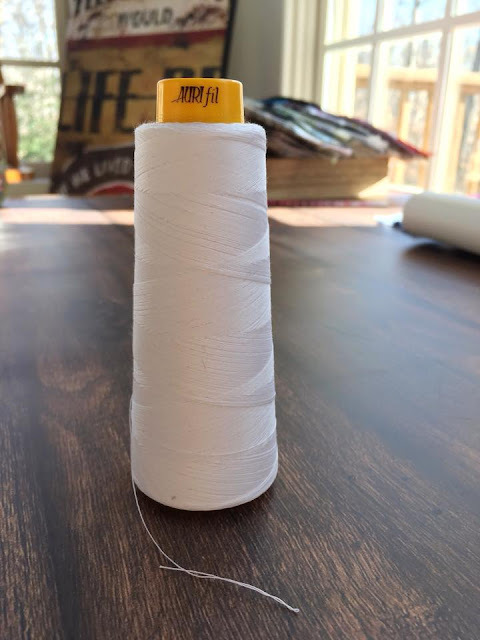 Interfacing, thread (I use Aurifil 40wt for my garment construction on my sewing machhin and Aurifil 40wt 3 ply for my serger...The 40/3 is the yellow cone), zippers, and bias tape are all items that you could possibly need to finish your garment. Know your sizes. Patterns are not the same as your off the rack size; they are based on your measurements. Measure yourself and remember that size is only a number, not a judgement. You are size BEAUTIFUL! Read all the instructions before cutting into your fabric. If there is something you do not understand, you can ask friends or look it up the answer online. For more fitted patterns and especially when you are making a more advanced pattern, create a muslin (as mentioned above). There are many good classes, books and tutorials on proper fitting. People are all different sizes and shapes. For my garments, I needed to make small bust adjustments and adjustments for a long waist. Once you have figured out how to do these adjustments, your items will be customized to your shape and will look fabulous! PDF patterns have to be printed then put together. Washi tape or painter’s tape is your best friend. You can use it to tape the pattern pieces together and if you mess up, you can easily remove the tape and try again. An added bonus is that both tapes are useful other places in your sewing room. Washi tape for the WIN! I did find that independent designer patterns were more clearly written – in a way most people could easily read and understand and/or figure out the steps with the images provided. On the other hand, commercial patterns seem to be written more for people who already know how to sew garments. If you’re beginning to sew or need a refresher in garment sewing, I recommend starting with independent patterns. Learning more about garment sewing helped me to appreciate how much work goes into everything I wear. Even my ten-year-old remarked on how much time and effort must go into every piece of clothing. Most children never see what goes into making the clothing they wear. It was a great life lesson for both of us. Garment sewing has helped me in my other sewing projects. The exposure to a different type of sewing seems to have given me a new perspective. I feel more confident to try new things, which is kind of exciting! If I can do this, you can too! Just take that first stitch! Fantastic info! Your dress (and you!) look gorgeous! I viewed the Patterns for Pirates website, but still not sure if I want to sew clothes just yet. My sewing time is limited and I need to work on projects that I feel I can complete and will work for me. I'll keep and open mind.